I promised I was done with my trip to Barcelona, but–as often happens when I travel abroad–I came home eager to cook my trip. Of all the things we ate during our ten days there, two dishes were immediate candidates for the Amateur Gourmet treatment: frittata & aioli. 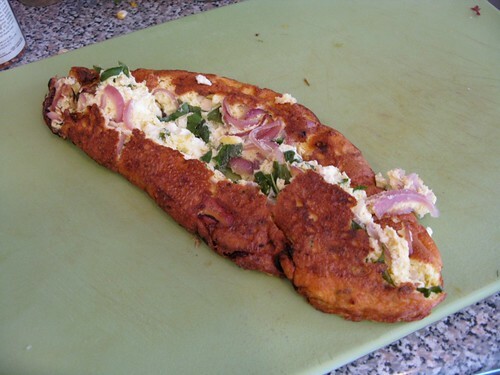 I’ve made a frittata once before; long ago, when Diana came over and we made tapas (and a corresponding video). That frittata was a firm sort of thing: the kind you cut into wedges and dip into aioli (which, now that I think about it, I also made for that video). But the kind of frittata I wanted to make was a frittata we ate at Cal Pep: it had potatoes in it, some kind of meat (chorizo? ), and then, on top, a thin layer of aioli. It was divine. Of course, I didn’t have any of those ingredients the morning I made my frittata. Instead, I had, in the fridge: feta, mint and onion leftover from a watermelon salad . 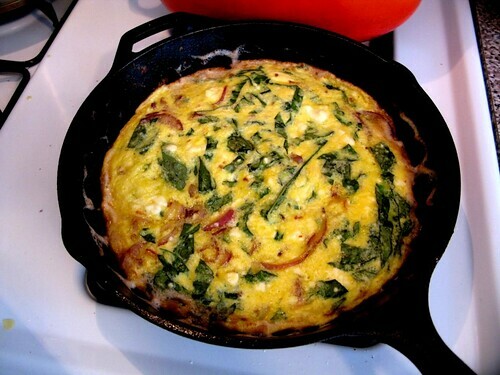 Still, frittatas are very forgiving–you can put most anything in them–so I heated some butter in a cast iron skillet. I turned up the flame high, added the sliced onion, let it cook down with some salt and pepper and when it was golden, I added six eggs (lightly beaten), a bunch of crumbled feta and some chopped mint. I stirred it all around and then let the frittata cook in the pan until it was brown around the edges. I had the oven heated to 400. Now, at Cal Pep, when they made their frittata (a process we could watch from our seat at the bar), they did it much the same way: cast iron pan, super high heat, everything happening fast. Only the man there flipped his over gracefully. I wasn’t even going to try that (especially since my cast iron pan is so heavy). So I finished it in the oven–I only put it in there long enough for the top to set, because I wanted the inside to be moist. But guess what? A failed frittata is still a good frittata. It may not have looked that pretty, but it tasted divine. The feta, the onion and the mint (all three of which I used pretty aggressively) made this a powerhouse of flavor, and the texture–the part I most wanted to recreate–was custardy and smooth, not grainy and hard like the overcooked one I made in the past. So even though, on the surface, it looked like failure: this frittata was a success. 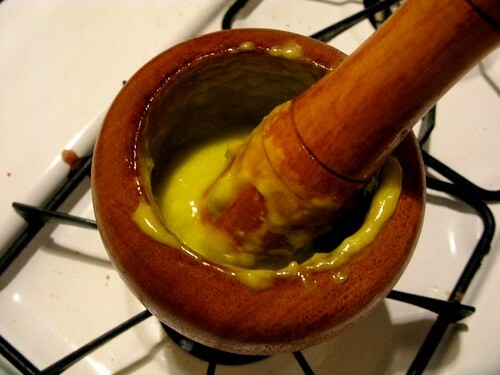 As for aioli, according to my Jose Andres cookbook, the authentic way to make it is with a mortar and pestle. The previous aiolis I’ve made have all had egg yolks in them, but the Jose Andres version is just garlic, salt and oil. This yolkless aioli was an intense garlic explosion, and a perfect topper for chicken or potatoes or even the frittata you just made and destroyed. You see aioli everywhere in Spain–it comes squeezed over your french fries at their fast food joints–and making it at home is an immediate and rewarding reminder of what everything tastes like back in Barca. Some people gaze longingly at slides and pictures from their vacation, I just cook my trip: it’s nostalgia you can eat.